Human and animal behaviour, both physical and mental, and new-generation problems such as urban delinquency, marital discord and the trauma of unicellular family life, all contribute to the growing field of psychology. In this book, an attempt has been made to examine some of the characteristic features of scientific method and their more important features. While the main emphasis is on the methodology of studying such psychological areas, it has been kept in mind that such a discussion cannot be fully appreciated unless it is built on some basic knowledge of psychological disorders, their investigation and treatment. To this end, this book also includes, along with a study of methodology, brief descriptions of such psychological phenomena sufficient to allow an understanding of the methods of examination and treatment. 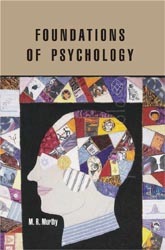 The chapters include: •	Classifying Psychological Methodologies •	Non-Verbal Conditioning •	Beyond Sensation •	Subjective Measurement: Psychophysics •	Methodology in Vision Experiments •	Experimenting on Thinking •	Memorising as a Learning Process •	Importance of Skin Sensitivity •	Technological Development and Aural Studies •	Bibliography This book, Foundations of Psychology, aims at providing an understanding of the methodological base for the study of psychology. It will, therefore, appeal not only to the psychology student and professional, but also to lay readers who may find it helpful in understanding their own behavior.